The complete ApPeel line from Castelli is unique in that these Made in Italy (but decorated in USA, so normal 5-7 turn around on orders) journals and padfolios are made from recycled apple waste. Yes, apples. When I first wrote about this line I mentioned “the silly questions”, saying the ApPeel Medio Notebook does not smell or not taste like apples. But now, apparently, they do smell like apples. Actually, you have an option of scents; apple, orange, lavender, or coffee. 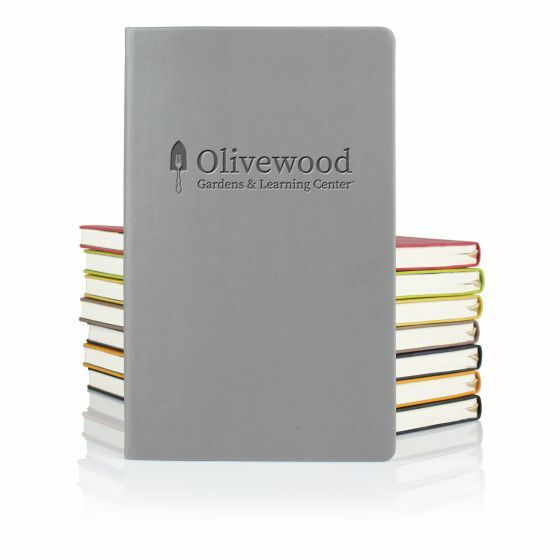 These is done by adding a sent packet to the completed custom journal. Also, each ApPeel Medio Notebook is printed with information explaining that the ApPeel Medio Notebook is made from apple waste, and so that this story can be easily incorporated into your our sustainability marketing message. Of course we love this idea for anyone working on campaigns for sales, production, or distribution channels in the grocery or fruit industry. If your company is doing something with apples specifically, all the better. And teachers gifts, as a nice Appeel Medio Notebook is likely more practical then an actual apple. If you are interested in the Appeel Padfolio to promote your own business, or to get a sample, email info@proformagreen.com for information and pricing.